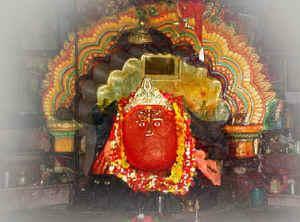 The temple of Budhi Thakurani is stituated in one side Sunasagad hill which is in the middle place of the Angul town . The Bigraha of the Goddess is made in Black Granite stone and looks like a pillar. It is the symbol of Budha Budhi Worship System tribal culuture. This type of customs also seen in the village of Ogi , Para and Begedia villages where Budha Thakur is worshipped and Purnakot,Jerang villages where Budhi Thakurani is worshipped in district. As per history it is not clear regarding the period of worship of Budhi Thakurani and at Angul. As per hear say, once upon a time this Angul was ruled by one Kandha named Sunas and he used this hill as Gada and accordingly the hill is called as Sunasagada. The Kandharuler placed this Budhi Thakurani and worshipped as his Esta Devi and in due course this place was full of deeply forest. In the year 1848 the Angul district was came to under control of British Empire and in the year 1896 they shifted their headquarter from Purnagada to Nuagada and planned the Angul town. They constructed road for convenience of the people. So it was required to clean the forest & at that time the hill came to their notice and they found that one pillar type of Goddess was there inside the deep forest. Then the era was cleaned and from that day the Goddess was worshipped as the Adhistatri Devi of this area and called as Budhi Thakurani.